The Radicals took offence for not being allowed to block the Rada. The head of the Radical Party, Oleh Lyashko said on 7 July that his faction announces a sit-down strike in response to the unblocking of the Verkhovna Rada. After that, the RP deputies sat in front of the rostrum. The parliament stalled from the afternoon of 5 July as Fatherland and RP factions announced that the assembly would not resume work until the deputies agree to adopt several bills, which, in their opinion, will help reducing utility tariffs. 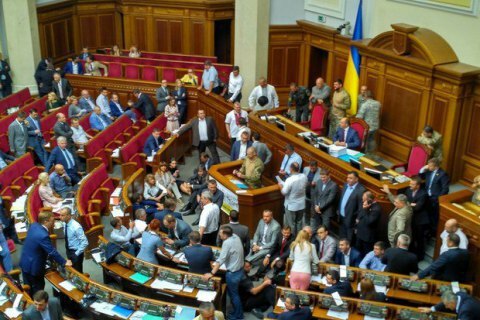 Earlier in the day, deputies from the coalition factions People's Front and BPP gathered near the rostrum and presidium of the Verkhovna Rada to prevent the parliament from blocking. Speaker Andriy Parubiy surrounded by deputies in camouflage uniforms opened the parliament session. Parubiy said that some lawmakers, who are the veterans of anti-terrorist operation, have volunteered to maintain order in the parliament.